You might have noticed that Mecca Bingo’s latest ad campaign is all about enjoying that special feeling you get from a great game of bingo. The team at Mecca are so keen for their customers to come away smiling, that they’ve decided to dish out generous amounts of bingo bucks all October with their Win Win Bingo promotion. That doesn’t sound strange so far, right? 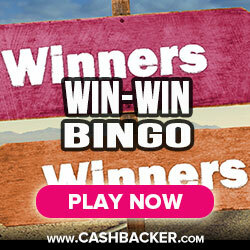 Here’s the crazy part – even if you lose a round of bingo, you’ll still be treated to a share of the bonus prize fund. This is every bingo lover’s dream come true. Keep on reading to find out more. The best way to get that incredible bingo feeling is, of course, to win a round and come away with some high cash prizes. With the Win Win Bingo promo, you can do exactly that regardless of whether you’re lucky enough to pick a winning ticket. The way this works is surprisingly simple. Buy at least six tickets for one of the bingo rooms where the offer is active (we’ll tell you which ones further down the page) then go ahead and play like usual. Winners will receive real money rewards but if you don’t win any part of the cash jackpot, your Mecca Bingo account will be reimbursed in bonus bucks. This means that whether you win or not, you won’t miss out. With ticket prices starting at just 10p and bonus funds going all the way up to £250, it’s easy to see why Mecca has named this giveaway ‘Win Win Bingo’. After all, there really is no way to lose. The Win Win Bingo offer kicked off on the 1st of October and will remain active until midnight on the 31st of October. The special games take place every hour on the hour exactly, from 8am until midnight. The only exceptions are 1pm on Saturday and Sunday, when no game will take place. There are no complicated terms and conditions to look out for with the Win Win promotion. Anyone based in the UK with a Mecca Bingo account is eligible to play, so if you haven’t signed up for the site yet – what are you waiting for? As we mentioned earlier, you must buy at least six tickets to qualify for this feature. It’s important to note that you have to purchase these tickets using real, not bonus, money. If you have an unsuccessful game, the bingo bonus will appear in your account no more than 72 hours after the game takes place. You will then be free to use these funds anywhere on the Mecca Bingo site, with the exception of games in the Win Win promotion.